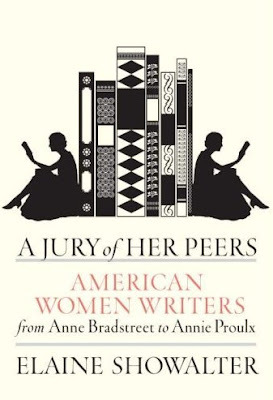 Elaine Showalter's history of American women writers examines "women's relationship to the literary marketplace" (read Katha Pollitt's Slate review), and the illustration pretty clearly spells out what that relationship has been for most of our history: women have supported the canon but have rarely been granted access to the center of it. they were wonderful spines. why not reuse them? Oh, I didn't mean to say that the beautifully designed spines shouldn't have been reused here. I wondered weather those particular spines were used because the Everyman's Library itself is supposed to be a canon of great literature, which throughout most of its history I'm sure has been a perfect picture of what the author is proposing. So as far as Barbara de Wilde's illustration is concerned, the choice is perfect. But the type layout is too crowded and feels very dated. Everyman's Library's spines were Barbara's own designs. Beautiful image; not sure about the type.